Ever ask someone to write down a local phone number and later notice they didn’t include the area code? Or how about watching a weather alert that tells you about a tornado warning in xxxyyy county? If you travel all the time like we do, you may have no idea what county you’re in, or what the area code is for local phone numbers. Now you do! All you need to do is tap the icon for an App called “Where Am I?” and all the information in the screenshot here will be displayed. We use this all the time, mostly for the county name, zip code, and sunset/sunrise time. It’s so simple! and send your location to a friend via email. If your friend opens it on their smartphone, they can tap on your location and Google Maps will navigate there! Speaking of emergencies – there are lots of ways you can set up your phone to help you. We discuss Emergency Contact Info, SOS calls and Emergency mode. We also demonstrate exactly what to do in Episode 163 of our Geeks on Tour YouTube show called What Does This Button Do. Chris Guld is President and Teacher-in-Chief at GeeksOnTour.com. She and her husband, Jim, produce a free weekly YouTube show called What Does This Button Do? 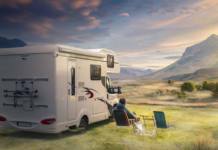 They have been Fulltime RVers, popular seminar presenters at RV Rallies, and regular contributors to RVTravel.com, for many years. Next articleWhat’s faster than a speeding Tesla motorhome? For me it’s a bust. I installed it, turned it on and it told me I was at a location more than 20 miles from where I am. It reported me on a forest service road off a state highway that turns off about 20 miles down the state highway I iive on. So, I immediately uninstalled it. Would have been nice for us. We live close to a state line & in our “out & about” drives we sometimes cross the state line without knowing it. I’m so surprised. We’ve used it all over the country and it’s always been accurate. Are you sure your phone’s location setting was on? Does Google Maps show you in the correct location? Where am I at? Really?